Welcome! Browse around, there's something for everyone. Looking for a recipe, I have probably cooked it; looking for the newest products on the market, I have probably reviewed it; looking for a great deal, I probably have one posted; looking for a craft----I'm working on that one; so stay tuned! With the kids back in school, the holidays will be upon us in no time; and that means a lot of baking will be going on in our homes. So head on over to Reynolds Kitchen to print out several coupons for wrap, parchment paper, crockpot liners and more. Click here to go straight to Reynolds website and then click on coupons at the top. This post is sponsored by ALDI; written by me to encourage you with some last minute gift ideas for this holiday season. With it being three days before Christmas, I still have gifts to purchase for friends and family. While I will admit, it is easier going out and buying something, wrapping it up to give to someone; I enjoy making several of our gifts for gifting. I can remember as a child my mother baking goodies and gathering fruit and nuts to make gift baskets for our neighbors. Of course, she handed that down to me and I to one of my daughters---our youngest daughter does a lot of baking during the holiday season and gives what she makes as gifts to her friends. I do a lot of my shopping at ALDI and I just love the fruit they carry! 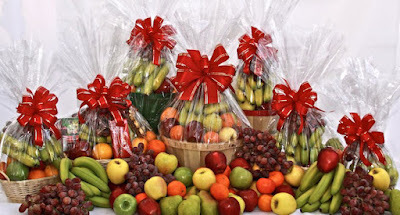 For many years now, people have received several 'last minute' fruit baskets from our family as their Christmas gifts. 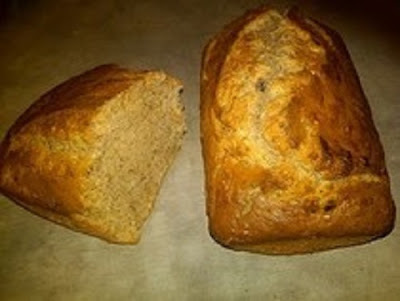 Each year we bake several loaves of banana bread for the holiday season, and many people have received my banana bread over the years as homemade gifts from our family. ALDI has all the ingredients that I need to make this scrumptious bread. My local ALDI store even carries wrapping paper and ribbon to wrap this bread up in. 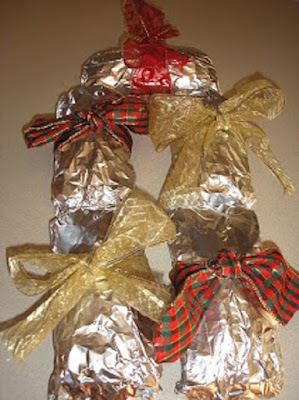 For my banana bread, I usually will just wrap it in foil and tie a pretty ribbon around the loaf. I have done this for several years for some of our friends that we go to church with and when they see me or one of our children pulled these foil packs out of the bag---they know what it is and are thrilled to receive it. For those of you that do not like to bake or even arrange fruit in a basket, fear not! ALDI still has you covered, simply take a basket and fill it with other ALDI products. For the pasta lover, make them a pasta basket filled with pasta, sauce, cheese, bread etc. For the cheese lover, buy several different cheeses, stack them on top of each other and tie a festive ribbon around them--no need for a basket either if you just wanted to use ribbon. 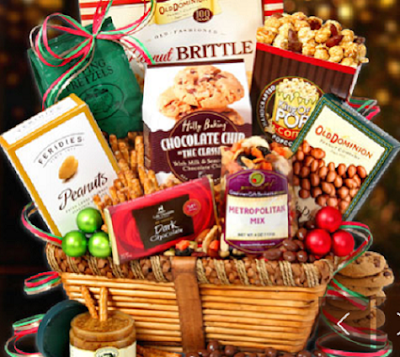 If you are buying for someone that has a sweet tooth, like my husband, ALDI has a vast assortment of candies, cookies and chocolate covered nuts that would look sweet in any basket. Tie a few pieces of ribbon or twine around a few pieces of the sweet stuff and it will look like you spent a fortune on it all while paying ALDI prices. ALDI carries their brand of items along with some national name brand items too, occasionally you will find clothes, luggage, kitchen and other house hold items while shopping at ALDI--which is always a fun experience for me, as I usually always bring something unique home from my shopping trip. So go ahead, gather yourself a basket and some pretty ribbon too, head to ALDI for some spectacular prices and unique items and make your family, friends and neighbors a gift basket they are sure to love! ALDI has come a long way since it made its first debut in the small mining town of Essen Germany. To locate an ALDI store near you, just CLICK HERE. First, enter your ZIP code. Then, select your preferred grocery store. Look for the "on sale" icon next to the recipe ingredients. Click on the icon, and we’ll tell you the price. Disclosure: The links in this post are my affiliate links. Read my disclosure policy here. New Coupons for you to Print: Crest, Tide, Freschetta Pizza, Maybelline, Oral-B, Grapefruit and Many more! Save $1.00 on any ONE (1) 26.2oz Bauducco Panettone. Unlock when you complete 1 Bauducco Foods activity. Save $3.00 on any ONE (1) Konsyl Balance (402 grams) or Konsyl Balance (450 grams) product. Unlock when you complete 1 Konsyl Pharmaceuticals, Inc. activity. Have you ever received a gourmet food basket or sweets tower that you ended up tossing out certain foods or sharing it with your family and friends, because you didn't like certain items that were in the gift set--I have! What if I was to tell you there was a gift box where each item was individually wrapped, had a long shelf life, and most of all, full of healthy foods, that actually taste good, that would actually keep you full? What if....? · 10 Chocolate Pillows---these were gone in no time flat! · 10 Zeppelin Lollipops---I think I ended up eating most of these, so so good! GoPicnic meals and snacks are perfect for emergencies, lunch, gluten-free diets, great for kids, great for on-the-go, perfect for portion control and great for travel. All of their meals are free from trans fats, high fructose corn syrup, added MSG, artificial flavors, or colors! 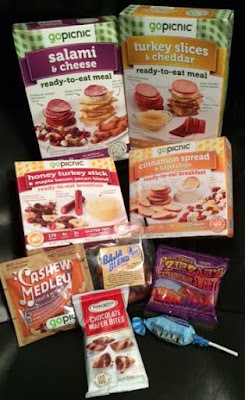 Holiday shoppers can purchase the gift box or buy individual GoPicnic items as stocking stuffers at Target or online at www.GoPicnic.com and Amazon.com . Disclosure: I was sent the GoPicnic Holiday Gift box in exchange for being in my HGG--no money exchanged hands. Read my disclosure policy here.